At Pilot Heating and Cooling LLC we focus on providing you with a solution to your heating and air conditioning repair needs/problems. This way you can continue to do the things you love. 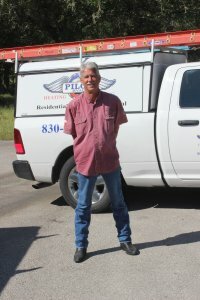 Pilot is a residential and commercial heating and air conditioning company based out of Spring Branch TX. We’re a family owned business and focus on helping people like you find solutions to their heating and air conditioning problems/needs. This company has been in business since 2004 and we plan on seeing many more to come. We have over 30 years of experience in this industry. We are licensed, certified and insured for everything you need us to do in the heating and air conditioning industry. If you have any questions about your problems/needs or what our process is like, don’t hesitate to contact us anytime at 830-980-2479. You can also fill out a VERY short contact form on our hompage. To see what other people have to say about us, go to our reviews page. To learn more details about us, see details below! We all come from different backgrounds (residential & commercial ac/heating, mechanical & electronics, business admin/management, accounting, real estate, etc…), but, have one major thing in common. The largest of those is how we love to operate as a family. So its an automatic that we love to be the same way with our communities that we help and serve. Family is what we believe in. As you can tell, the Pilot Heating and Cooling LLC team really loves and believes in family. We think that it is the very foundation that not only holds us up, but, what holds our communities up. It is what brings people together in a common bond and helps sustain and feed one another. Just like the title says, Family, People and Community. People make families and therefore a communities. They are what is most important in this life. Period. I am a wife and mother of 2 who helps run this residential & commercial heating and air conditioning company while raising 2 kids and taking care of my husband. As a woman trying to provide for her family, and help my husband get the medical help he needs, I do my best to provide quality service to the owners of this company and especially our customers. I love helping the Spring Branch TX community and its investors with their heating and air conditioning needs. 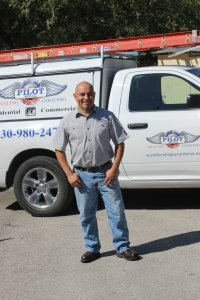 I have been with Pilot Heating and Cooling LLC for 4 going on 5 years now and still enjoy it to the fullest. I am looking forward to many more years of working with this wonderful team. I Graduated from Healy Murphy High School. I also Graduated from NIT with education in Computerized Business Systems. I’m also educated in Real Estate. I took and passed all of the agent required classes but never got around to the licensing test. I was a Certified Apartment Manager as well at one point. My personal educational experience is in small business management and sales. 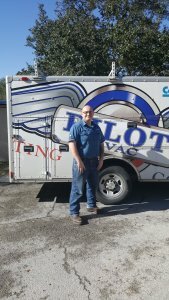 I am the face of Pilot Heating and Cooling LLC and I handle the business management, book keeping, appointment scheduling, customer service and other operations of this company. I love my family and spending time with them. My children and grandchildren mean the world to me. Giving is a big thing to me….. I am a full believer of being giving. I like motorcycles, hotrods, hunting, steak and going to hang out at the lake. I am a husband and father of 2 who helps this residential & commercial heating and air conditioning company with systems diagnoses and projects management. As a man trying to provide for his family and take care of the communities heating and air conditioning needs, I do my best to provide supreme quality in my diagnoses methods and customer care. I know how it feels to want to solve your problem as efficiently as possible so just know that quality, efficiency and being thorough are what I am about. 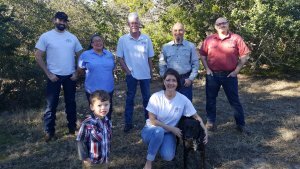 I have been with this company for 6 years now and I love helping the Spring Branch TX community with their heating and air conditioning needs. I graduated from Ysleta High School. I was in the Navy for 24 years. I attended the Lennox training center in Carlton TX for my HVAC education/training. (Build-A-Tech) I also graduated with a Bachelors in Business Management from The University Of Phoenix. 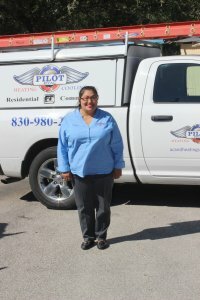 I am a owning member of Pilot Heating and Cooling LLC in Spring Branch TX and I mainly handle the diagnoses process and repair/installation management. Which is pretty much the Project Management process. I love my family and like spending time with them. I like doing home improvement projects, real estate investing, motorcycles and being artistic.